A couple of days ago I start working on designing a bookcase for for the guest room in our house. I’ve done a couple of other projects for that room and we really just need this bookcase to finish it off. 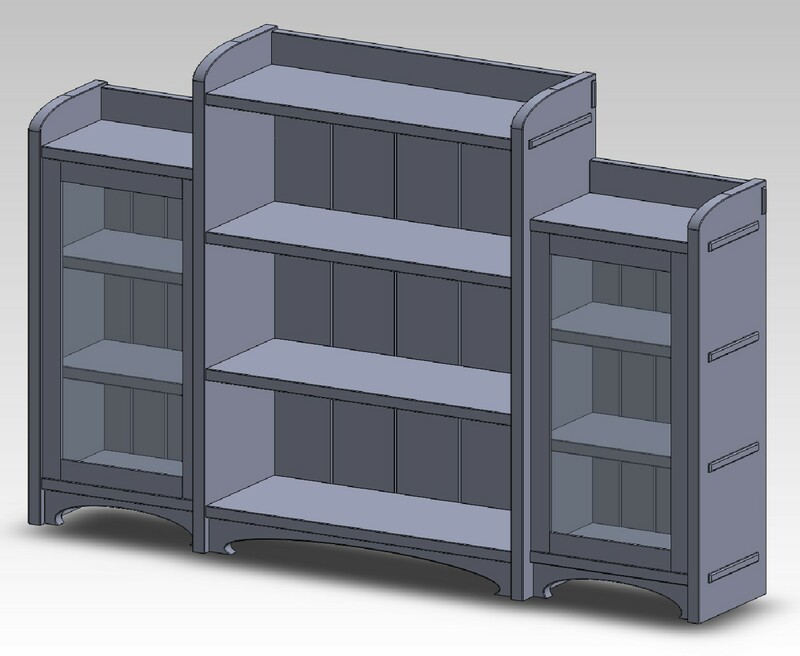 The design brief looks like this: The finished bookcase has to be wider than it is tall, roughly five feet wide by maybe three and a half feet tall. It will be made from Quartersawn White Oak and finished with the same regimen as the cabinet and sconces I made so it matches in color. The style should tend toward “mission” or “craftsman” within the Arts & Crafts genre. I’m generally fixated on Greene & Greene these days, but this works too. For myself I want to incorporate some stained glass work, and it’s important to me that this be more than a rectangle with shelves and mission-y details. In the previous post I started by laying out a 2D drawing of the rough proportions first, then building up the initial components and assembling them in SolidWorks. I ran into a couple of problems, neither were insurmountable, but I ran out of time to go through the model and make all of the requisite changes. I won’t rehash all of the specifics, but the main problems were around how to fit the back and clearance issues with the side pods and not having enough room to fit everything. I’ve solved both problems. For the back — for now — I’m going with a solid wood ship-lapped back. I changed the width of the staves for a little more visual interest. They will be screwed into a rebate on the back of the case and into each shelf, which should lock everything together reasonably well. For the side pods I made them deeper by an inch and shortened the length of the mortises, moving them further back from the edges of the case sides. This gave me (barely) enough room to inset the middle shelves and door. I also chased down several other “bugs” in the model, so this is probably close enough to reality that I could build it. Now that I have the basic “bones” in place I can start playing with the details to develop a better feel for it. I’ve already tweaked a few things, for example I removed the through tenons on the toe kicks, I decided that didn’t add anything and it felt inconstant to have them on the side pods but not the center unit. And adding through tenons on the ends of the toe kick on the center unit would be visually messy with the side pods. I want to play with the height and shape of the backsplash components, explore different options for the case back, add hinges, door pulls and of course figure out the stained glass design for the doors. I’ve got another several hours of CAD-hackery to go before I’m ready to decide it’s ready for construction — and then the real work begins. I’m worried about getting the wide Quaretrsawn White Oak for the project though. Usually when I see this material it’s in narrower widths. I can certainly glue up narrow bits to make wider pieces, but for the sides and top shelves at least I really want solid wide boards with some dramatic ray fleck figure. Realistically I’m at least a week from being able to start on it as I need to finish the Thorsen House Cabinet first. The woodwork on that cabinet is 99% done, there are just a few details to complete, finishing and making the stained glass for the door. I’m really eager to see that one come together. Nice shape tho, really like the curves of the bottom. Thanks – I haven’t sorted out the stained glass design yet, but my thinking is the most of it is going to be clear, divided into rectangular panes with one pane having a stylized / opaque design. The clear glass will have some sort of light texture and be “seedy” (have some random bubbles). Why such long tenons on the ends of the shelves? The mortises in the sides almost crosscut them into pieces. I think it would be a structural disaster. Functionally, you also lose the feature of adjustable shelves. Well, through tenons are a stylistic feature, but I get your point about the length of the through tenons (e.g. the amount of the sides that are cut away). I agree, and I think I’ll make them into twin tenons in the next revision, more like the way this one below. The middle shelves are already fixed, they have stub tenons on the ends of each shelf. I think that will make is stronger than having adjustable shelves. i have used old glass from different sources like window shops and salvage yards to achieve a much nicer look than new glass. it is a pain to deal with and clean (razor blade lubed w/ windex) and random pieces may not break predictably. the doors on some of my pieces have weighed 25 lbs each, so i move the pieces w/o the doors. i use sliding dovetails to fix intermediate shelves, and always align the shelves with mullions on doors. i like the thru mortises on the bottom example and often they were made long enough for a keyed tennon to be added. many of the old pieces were made from thicker stock, it will be noticable if you don’t. stickley made some nice three door bookcases with many panes of glass, all uniform across the front. also have made a copy of gamble house bookcases. very hard to get the details all looking right, but one of the pieces i am most proud of, and no glass! veneer panels with many arts and craft inlay designs are available on the www. Thanks for the comments Keith, your suggestion on scrounging for old glass is a good one. For the clear glass in the door I’m planning on using a clear art glass made by Armstrong that has some light texture and bubbles. Nothing “pattern rolled” like decorative architectural glass with mechanical looking ripples, just some slight uneven surface texture. I’ve almost made up my mind to “take the plunge” and go with sliding dovetails for the middle two shelves in each unit, that will certainly address any concerns about structural integrity. I like the challenge of designing this piece, I think (once I sort out a few more details) it’s going to be a nice piece. To clean dirty glass, I use a scraper and cleaning cream for vitro ceramic cooktop.